Treasure trails are a minigame where you find clue scrolls and solve the various challenges presented to earn a reward. Each treasure trail is made up of multiple stages, but all treasure trails are started by getting a clue scroll drop from a monster. Refer to Treasure Trail Rewards for the exact items you can receive. You can only hold one clue scroll at any one time, so if you have one nestled in your bank, you won't be able to get another from a monster. A set of rewards from the reward chast you receive at the end of a treasure trail. 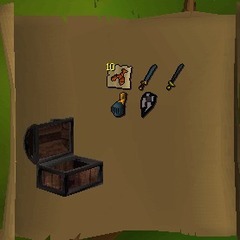 There are three types of clue scroll in /v/scape, Easy, Medium and Hard, often referred to as Level 1, 2 and 3. The quality of the rewards for completing each type scales upwards, with Hard clue scrolls producing some of the most coveted items in /v/scape. Easy (level 1) - Maximum steps: 4 - Rewards may include vestment robe pieces, elegant clothing and emote-enhancing gear. Medium (level 2) - Maximum steps: 7 - Rewards may include ranger boots, essential to rangers and quite valuable. Hard (level 3) - Maximum steps: 11 - Rewards may include highly coveted third-age armour set pieces, which can be sold for ludicrous amounts. Click below for monsters that drop clue scrolls and which clue level they are. Killing Goblins - Gobbos can be found easiest across the bridge in Lumbridge. Pickpocketing H.A.M. members - H.A.M. members can be found in their dungeon hideout between Lumbridge and Draynor requiring 15/20 thieving to pickpocket. Killing any type of city Guard like in Varrock/Ardougne. Hill Giants and Moss Giants (which pairs really well with slayer training). Killing Jellies. They can be found in the Frememnik Slayer Dungeon, which is east of Rellekka. Killing Green Dragons - Found in the Wilderness, which is normally empty, but you risk being attacked by other players Pandas. Killing Blue Dragons - Taverley Dungeon has several that are very easy to get to with 70 Agility. Killing Black Dragons - Taverley Dungeon if you have 80 Agility, or the Evil Chicken's Lair in Zanaris (costs 1 raw chicken for entry), although you need to have completed Sir Amik Varze's sub-quest in Recipe for Disaster. Coordinates - You have to go to the coordinates specified - you're meant to use the sextant and watch to do this. Anagram - You have to unjumble the words and speak to the NPC who's name it is. Cryptic - You have to solve the riddle and search, dig, etc where it says. Map - You need to work out where the map is and dig in the location of the cross. You may be attacked by a Saradomin or Zamorak wizard when you do this. Puzzle - Given in addition to other parts, you'll have to solve the sliding puzzle before speaking the NPC who gave it to you again. In /v/scape, most of our clue locations are a bit different than they are in Realscape due to mapping differences. Thankfully helpful wiki editors have contributed pictures of the exact spots of all of them so you won't get too confused and won't have to check the inaccurate OSRS wiki. Click here to go to our Coordinate clue page. At the moment the non-coordinate clue page is nearly complete, but most level 2 clues are missing from it. For the ones not on the /v/scape wiki, you may check the requisite pages on the 2007scape wiki and if they're inaccurate simply ask others if they know the solutions for the time being. Click here to go to our Anagram, Crypic, and Map clue page. Be warned that level 3 coordinate clues will always spawn a hostile wizard when you dig! Strong Saradomin mages will spawn outside of the wilderness, while weaker Zamorak ones will spawn during clues inside the wilderness. Level 2 coordinate clues will never spawn a hostile wizard, and coordinate clues are not possible during level 1 treasure trails. You need to defeat the wizard before you can dig again to progress. Saradomin wizards are quite lethal and can poison you with their dragon dagger when not casting spells at you so stay back and range them if possible, while Zamorak wizards are helpless if you can use the Protect From Magic prayer. Otherwise, just tank them with enough food and hope for the best. Clue steps with specific requirements to complete, such as the completion of a quest, will have their requirements listed with the clue on the solution pages. For coordinate clues you do not need a sextant, watch, or chart - just a spade to dig with. The general drop rate for clue scrolls is increased from Realscape. Another piece of advice is to always keep a map of the world open as you adventure around, and you may want to level up your magic a bit for convenient teleporting around the world that you'll need to go, or look for somebody to sell you teleportation tabs/jewelry. The maximum amount of rewards one can get from a clue is up to 8. 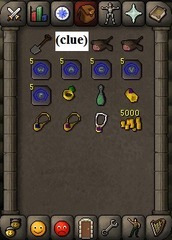 This is not affected by the level of the clue, and the rewards cannot be duplicates. Here is a recommended setup for when you get a clue scroll for convenience's sake so you don't have to bank very often, if at all. Keep at least 8 slots free because that's the highest amount of rewards you can get, and keep around 4 extra slots free for things like keys or waterskins for specific clues that need them.